Dutch photographer Evert Smit (Fotovakschool Amsterdam, 2015) shows a fascination for landscapes in his photography. 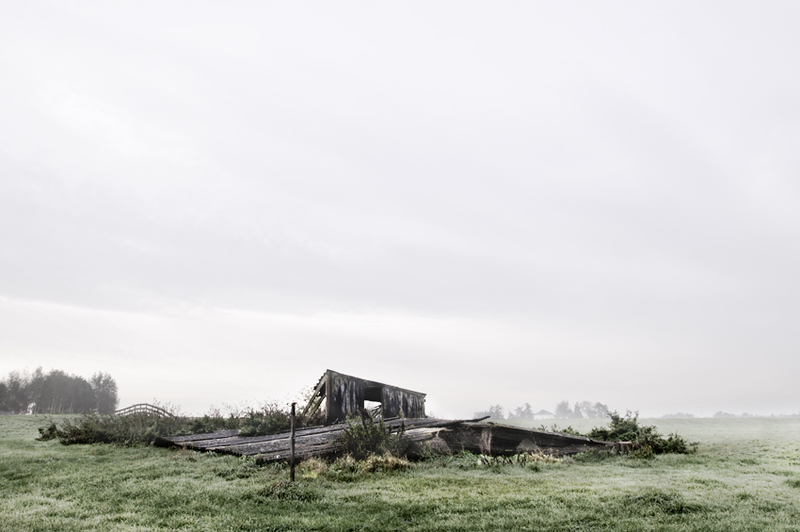 In his series Leeg in een vol Noord-Holland (translated: Emptiness in a full North-Holland) Smit explores the rural landscape in the northern part of the Netherlands. Near the capital of Amsterdam, the largest and most crowded city of the country, one can find endless empty fields in which small wooden barns arise. Some of these cabins are still in use, some are abandoned and in decay, some give shelter to animals. The contrast between the modern bustling city ands these old lonely barns in the empty fields could not be more stark. Smit’s photographs remind us of the 20th-century photographs by Bernd and Hilla Becher in which they tried to preserve the functional architecture of the industrial past for future generations. However, Smit’s images try to preserve a different kind of past, one that signifies the emptiness of the typical horizontal Dutch landscape, made famous by Dutch landscape painters in the 17th-century. With urbanization in full swing in the Netherlands, Smit makes an homage to his predecessors and shows the disappearing beauty of his home country.